Sad news. I hope he beats it again. A lot of times cancer returns with a vengeance. Hopefully not in Kelly's case. Hall of Fame Buffalo Bills quarterback Jim Kelly’s oral cancer has returned, his surgeon, Dr. Thom Loree at Erie County Medical Center, announced in a statement. “Jim Kelly came to ECMC this week for continued testing related to his oral surgery. Unfortunately, it has been determined that his cancer has returned. Our team of head and neck cancer specialists is determining a course of treatment that will allow Mr. Kelly to battle this cancer successfully. Mr. Kelly has asked that you keep him and his family in your thoughts and prayers,” read the statement from Loree, the head and neck surgeon and clinical director of plastic and reconstructive surgery at ECMC’s Center for Oncology Care. We will pray for you Jim!! Sad news indeed. My family has benefited from his sons foundation "Hunters Hope". They provided us with housing in Durham NC while both my boys received stem cell transplants at Duke Children's Hospital. 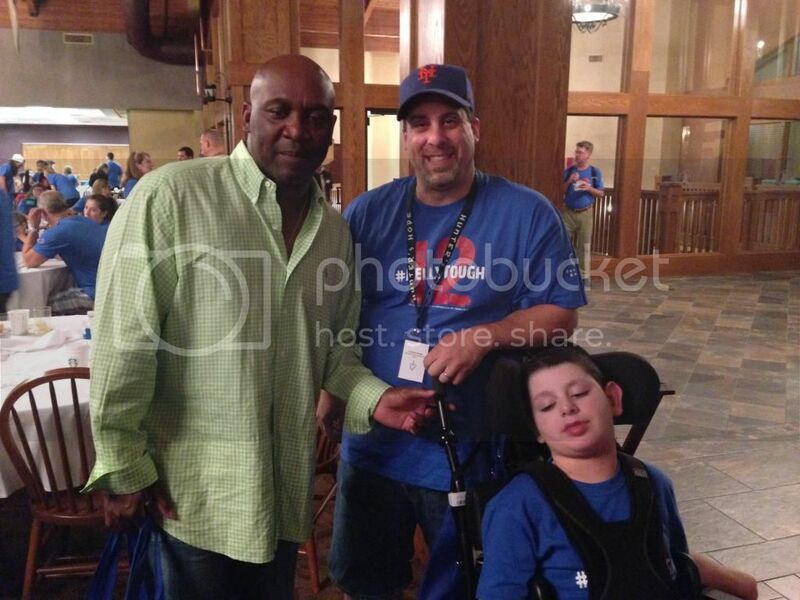 We finally got to meet him last summer at thier family symposium. What a great organization they run. 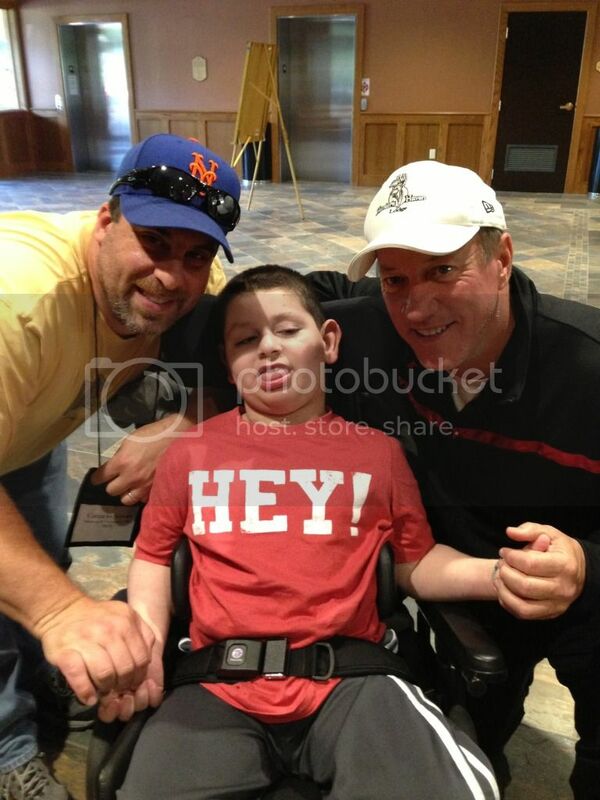 Jim was easy to talk to and was great with both of my boys. He did say that he loved squishing the fish. Here is a picture of Jim with my oldest son. Very sad news! I wish him and his family all of the best. phinsfanmel, you are a hero for being so strong my friend. I wish you and your family good vibes and prayers. I believe he is having surgery today. And Prayers for Jim Kelly too. His cancer is starting to spread. Prayers to a tough son of a gun. It sounds really bad and I don't think the prognosis is good. Elway commented that the "report is not good" and they are hoping for a miracle. He was supposed to have surgery Thursday and it has been pushed to next Tuesday. All reports are also indicating that he is currently very weak. I fear where this is going. There's been a lot that has been said so we thought it would be best to clarify. At this point and time surgery is not the best option for Jim. Because of complexity and aggressive nature of this cancer and after more scans and tests, the plan has changed. At this point, Jim will not be having surgery. The cancer is in areas that surgery cannot successfully eradicate. Therefore, the medical specialists here in NYC along with our Buffalo team believe that chemotherapy and radiation are the best option. I hate to be all gloom and doom but if surgery isn't an option, that means it has spread so far into his organs that he doesn't have a decent shot of pulling through. This is so sad for Jims family and the owner. Saying prayers for both of their family's. 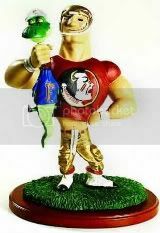 Sad, hopefully The U does the same thing. I don't know if anyone posted this but his cancer is so bad that the Dr's have opted not to operate. So sad. 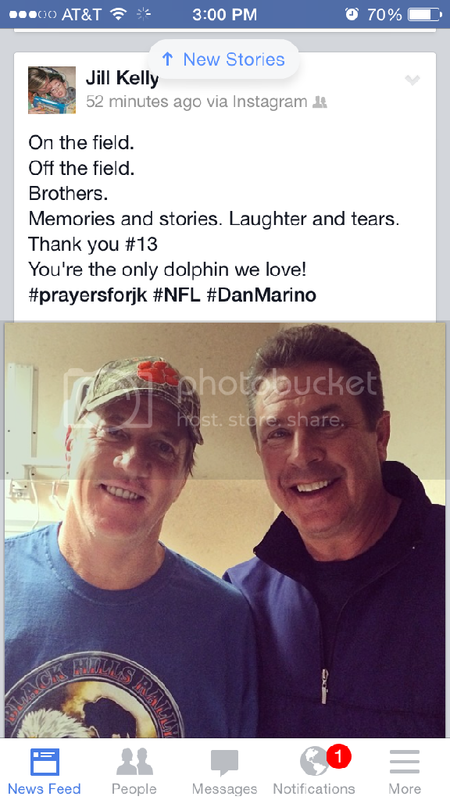 The first time I ever got to see Marino and my Phins play was against Buffalo in Buffalo. And a long time ago I reported for this website on another game at Buffalo where there was a huge snow storm and joked at the time that Kelly had to summon the storm himself. Godbless and good luck, you have been and remain a class act. Yes I saw that post. But he was to have surgery to try and save him. The Dr's have now determined that parts of the cancer is inopperable and the prognosis is grimm. Doctors have changed their plan of attack on Hall of Fame quarterback Jim Kelly’s oral cancer, calling off his surgery and choosing to focus on chemotherapy and radiation treatments. I forgot Marino and Jim and others came out in the 1983 draft. Such a great of players came out then. I'm sorry I just can't remember who they were. A couple of updates for those who are interested. 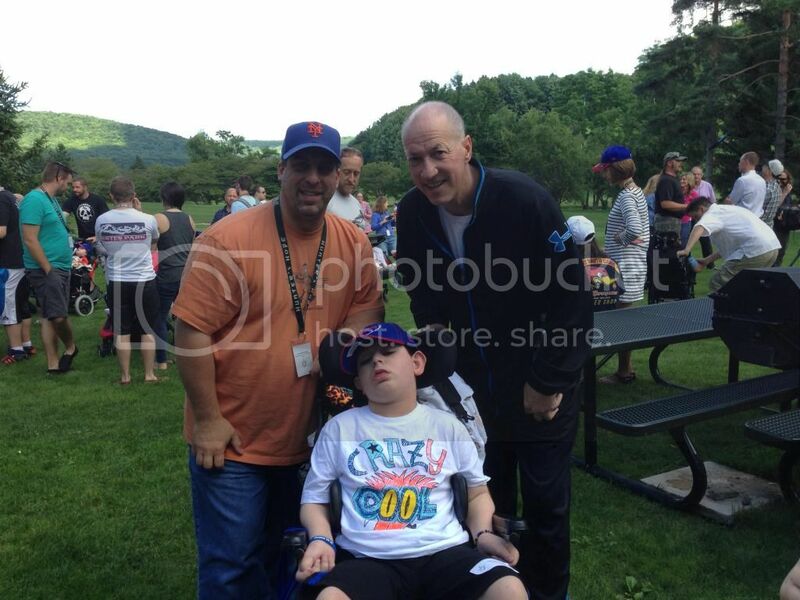 Dan the Man has visited with Jim Kelly. 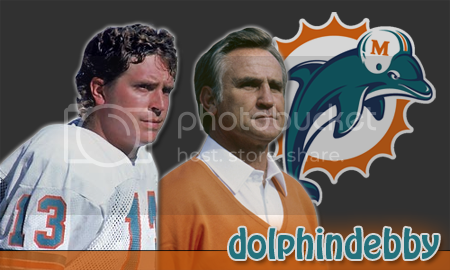 Notice the last line from Jill Kelly: The only Dolphin we love! Praying he can beat this a second time. Radiation and chemotherapy treatments for sinus cancer have taken away Jim Kelly's hair and he's dropped 51 pounds, but the former Buffalo Bills quarterback hasn't lost his sense of humor. He's scheduled to have an MRI in the middle of August to determine how well the treatments have worked. "The best thing for me is when I'm up in the morning and I'm eating my breakfast through my tube to see my daughters and my wife walk out and to see the smiles that are always on their faces every single morning. That's what I need," Kelly said. "When you've had family support like I've had and public support like I've had there's no way that I'm not going to beat this because a lot of it's mental." Asked if he's afraid of dying, Kelly smiled and said he is not. "If it's my turn, if the good Lord decides that 55 is my age, so what. I'll be going to see my son (Hunter) a little earlier than I thought I was going to. But the key for me is I know I have a lot more to do, a lot more lives to change and a lot of people out there are going to change my life. I'm still a long ways away (from dying), I hope and pray." I started a thread in The Lounge forum to send him well wishes and/or prayers. I hope to see him at the walk that my family and I are doing next week for his son's organization. I hope to print that thread out and personaly give it to him. At the time of the picture, his nephew Chad was on the Clemson football team. He has since been dismissed as he is a bit of a problem child. As for Jim, it sounds like he is doing better. An initial set of tests found no cancer. He has a more extensive set of tests coming up in August that will tell him more. Hey guys. I'm at the Hunters Hope Family Symposium here in Western NY. Had a chance to talk to Jim this morning and passed along all the prayers and well wishes from this thread to him. He appreciated it very much. He looks good and gave a long 10 minute speech to all the families last night. Sorry to keep bumping this thread back up. As I mentioned earlier, ESPN and NBC were are the family symposium doing a feature on Jim Kelly and his organization. Both will be airing on Sunday. First will be ESPN's Outside the Lines at 9am. Then NBC will air thier story during Halftime of the Hall of Fame Game on Sunday Night. Maybe the boys and my family will be in the background somewhere?? I will post any links to the stories once they are available. Here is a link to the entire NBC piece. My son Sal is at 3:38 and 5:18. I'm in there too in a bright orange shirt wearing my Mets hat. Hunters Hope has been a big emotional support group for us. phinsfanmel, first off I am very familiar with following Jim Kelly over the years and how his family dealt with their situation with their son and the fact that they run the Hunters Hope Program. I am terribly sorry that you are also going through this with your son and I am glad to see you are able to participate with this support group. May the Good Lord continue to watch over your son and your family. The latest on Jim Kelly's health. Hall of Fame quarterback Jim Kelly announced two months ago that he’s now cancer-free, but he continues to deal with health problems. Kelly, the former Miami Hurricane who was honored by his alma mater on Saturday, told the Miami Herald that he still needs to use a feeding tube. Kelly, who had cancerous tumors in his jaw and nasal cavity removed, has recently been dealing with a staph infection. Despite his continued health problems, Kelly said he’s optimistic about his long-term prognosis, and keeping his spirits up.